Glassy Lite is the next generation product for headlight restoration. It will restore your old and worn out headlights. Having cloudy, worn out headlights can make your car look older than it is, not to mention it is a a safety hazard when driving at night. Driving around with hazy headlights can reduce your vision by up to 50% and no amount of scrubbing can make them better. But GlassyLite can help. It has nano-technology used by aerospace industry that will restore you headlights and form a thin glass seal that protects it from future damage. Don’t waste hundreds of dollars getting new headlights when you can make your old ones clear and bright again with Glassy Lite. 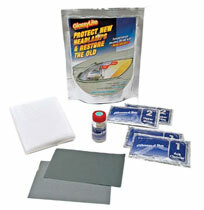 The GlassyLite Kit includes the GlassyLite Professional Restoration System, a heavy cut sandpaper and a special polishing cloth. It is only $34.95 plus the cost of shipping and handling. This offer is not available in stores.